A Transport for London moquette seat covering in the 2011 Barman design, named after Christian Barman who commissioned the first moquettes for the London Underground in 1936. Moquette, derived from the French word for carpet, is a type of woven pile fabric in which cut or uncut threads form a short dense cut or loop pile. As well as giving it a distinctive velvet-like feel, the pile construction is particularly durable, and ideally suited to applications such as public transport. Its upright fibres form a flexible, non-rigid surface, which are constantly displaced to give durability and anti-stain benefits. Traditional moquette fabrics are made from a wool nylon face with an interwoven cotton backing. Moquette originated in France, where it was woven by hand. The standard width was a Flemish ell of 27 inches. There were two finishes: moquette velouté, which had a cut pile like English Wilton, and moquette bouclé, which had an uncut pile like Brussels carpet. It is still woven in Yorkshire using traditional techniques. A long-standing moquette manufacturer is Holdsworth Fabrics which dates back to 1822. The most famous moquette in the United States is the one sent by Louis XVI to George Washington. It was made for the banquet room in Mount Vernon, where it can be seen today. 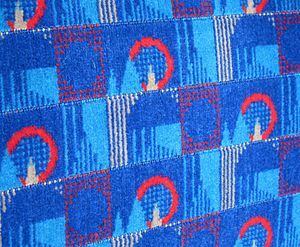 Moquette is famous for being used on London Transport's vehicles, particularly the seats of London Underground's Tube trains. During the decades of the many railway companies, there were some ten moquette manufacturers in the UK. As a result of the nationalisation of the railways after World War II and then the Beeching cuts of the early 1960s, the number of customers plummeted. By the mid 1960s there were two suppliers, one of which was Courtaulds. The other is Holdsworth Fabrics based in Huddersfield, UK. Moquette is occasionally used in clothing. In 1932-33, the United States Army Air Corps contracted for cold-weather leather flight suits lined with moquette, apparently as an economy substitute for sheepskin. ^ W. A. Gibson-Martin (1932). Ship-furnishing and Decoration. p. 71. ^ a b Mildred Jackson O'Brien (2005). The Rug and Carpet Book. p. 54. ISBN 1-4191-5185-1. Archived from the original on 2012-11-14. This page was last edited on 9 January 2019, at 20:56 (UTC).